Microsoft Access 2010 is a database management program from Microsoft Corporation. 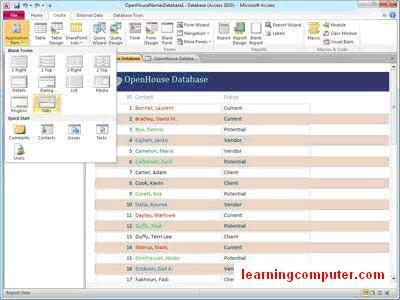 Access 2010 is a program that can let anyone create a functional database as quickly as possible. This product is part of the Microsoft Office 2010 suite of programs. There are many different features that are used in MS Access 2010. Besides databases, Access allows anyone to create the best looking reports that they can use. These reports can be made with incredible ease to handle functions that Microsoft Access uses. These functions are great in that they will allow anyone to do more things with their reports. This is a big point that Microsoft Access 2010 uses when getting it to be used for all sorts of functions. The main point about the Microsoft 2010 Access program is that it has an incredible easy to handle user interface. There is no need for a user to go to the Access 2010 help menu often to get things done. This is due to the fact that MS Access 2010 uses an easy to handle system that features a variety of templates and wizards for all sorts of functions alongside different items that can be customized with the end users needs in mind. Here is what the layout of Microsoft Access looks like in this new version of Office 2010. 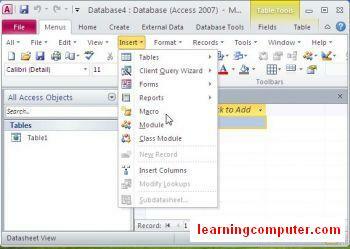 How to Start Microsoft Access 2010? You will be sent to the front page where the program can guide you to create a new template or the option to open up something else. The opening page of Access 2010 was shown right above. You can choose to create a blank access database or work with a certain template. You can even save your own templates over time. 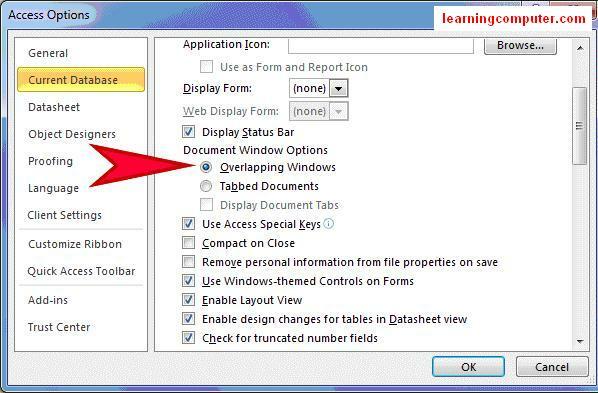 The File menu is the first new feature of Access 2010 when opening up the program. Remember this one was called Office button in Access 2007. The menu has been improved since the last version of Access 2007. The File menu, which can be seen on the following screen shot, allows a person to get help on how to do things, open a new project, save or open an existing project and even change the options on a program. Databases can even be shared with other people. Here is the general appearance of a menu on Access 2010 shown in the screen capture below. This is the menu that would be used for a case when a database is being programmed. This menu is very straightforward and can be simple for any computer user to handle. This is regardless of previous database creation experience. 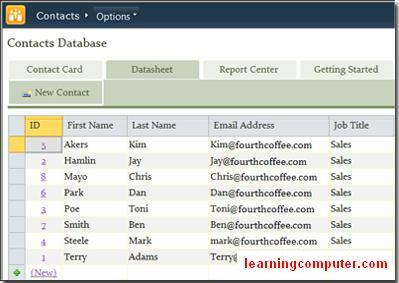 You can use is to create a database table, access query, data entry forms and reports in an Access database. The data bars will be used with the intention of creating more vibrant types of services that will be very easy for anyone to take advantage of. In fact, the data view can be easy to work with. This is a feature of Microsoft Access 2010 that can be used to find visual information faster and to work as effectively as someone can. There are also new Themes in MS Access 2010 just like Word 2010. These themes are used to create a variety of database objects without too much effort. 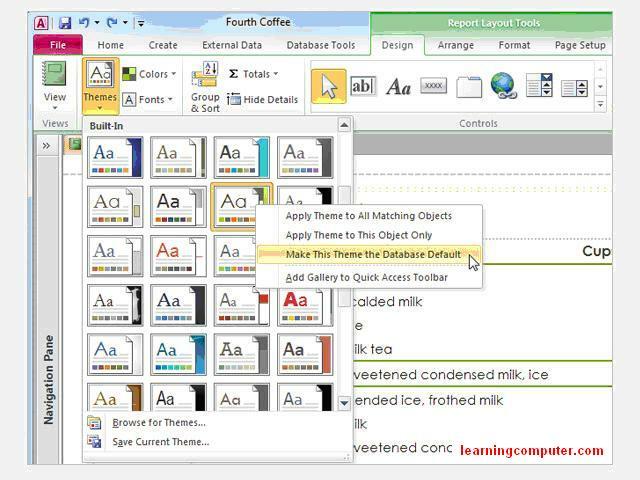 With these themes in Access 2010, formatting tasks are easy for anyone to handle. The themes can be found on the Design bar as shown below and can be found under the File Menu. Below is a screenshot to show how the new themes of Access 2010 in Office MS 2010 looks like. The Share part is especially valuable feature in MS Access 2010. It involves getting the access database on a program to be read through an online browser or to get people to see things on a web browser. The program can even be used to check on the compatibility that is used for getting the browser to work properly on a computer. This is a critical point of the database that anyone can review. The picture on the bottom refers to the ability of the program to be used and how the checker can be used. As it can be seen here, the program can report on all issues that might impact the ability of a database to be viewed online. This should be reviewed when trying to get the Access 2010 program to be used for any reason. Below is a screenshot which shows how to share your Access database. – Try Acess Online Training for No Money Down!! There are a number of different options to use with Access 2010. The Options menu will be found under the Help section on the File Menu tab. Here is what the Access options dialog box looks like. 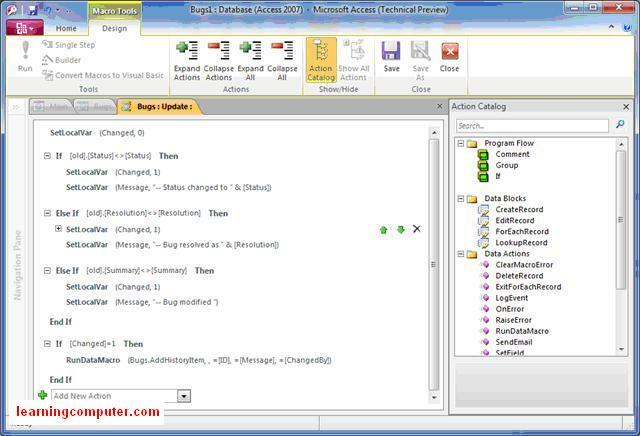 The things that can be done with Access 2010 through this options screen are vital to the user of this database application. 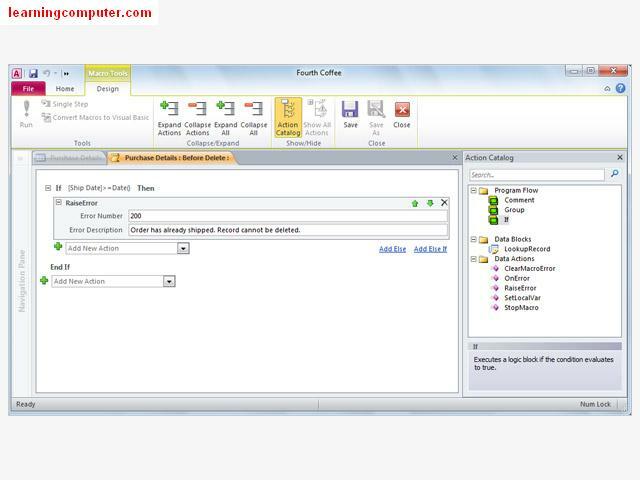 For example, Access 2010 can allow a user to control general options that relate to how the calculations are going to be handled on a database. It also works to give users the ability to change proofreading standards and how objects are handled. Other Access 2010 features can be altered in the menu with functionality in mind. These include such functions as language, the ribbon icons and bars that can be used and the ways how Quick Access can work. The Trust Center is a very convenient feature to use. This Access 2010 function allows the user to change the security features of Access 2010. This includes changing how the program can work with other Office applications. This includes changes to the trusted documents, locations and publishers that documents can work through. There are also controls to determine if certain add-ins can be brought in with digital signatures or not. This can be beneficial but it may end up influencing the way how a computer can work with different kinds of functions in mind. The Ribbon can be customized as well. This includes changing the ribbon with regards to the different types of functions that can be listed here. 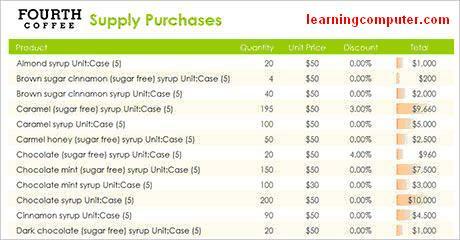 These include such functions as the Form, Report, Print and Table functions. The options that can be used here will vary by each type of program that may be used here. One part of Access 2010 to use is the Insert menu. This is used to insert a variety of different things into an Access 2010 file. These include other Office files from different types of programs in the Office family. -Modules: used to get the program to work with more efficiency. An interesting point about the Access 2010 menu is that it is practically the same as what was used in Access 2007. Therefore, an experienced member can have an easier time with using Access 2010 without any substantial problems. This is a smart function of Access 2010 that any person can take advantage of. After you create a table in MS Access 2010, you can add data to it by double clicking the table under All Access Objects in the left pane. In our case we added a table called AddictiveTips, now we are going to add data into it. This is illustrated in the follow screen capture. The next part of Access 2010 to review is the Format menu. This menu is used to change how the Access 2010 database looks. This includes the use of creating different rows and columns alongside different kinds of heights and widths. The fonts can be changed as well. A big point about the Format section of Access 2010 is that it can be used to handle the creation of subdatasheets. These can be used to create further details on data in a screen. This can be used to create a more appealing looking type of tool for anyone to handle. The goal of this is to make the database look proper so it will be easier to not only read but also easy to navigate around. The Records menu of Access 2010 can work to control the records that are used. This includes determining which records are going to be viewed in a table or report. A filter can be used to get the records to be changed. The data can even be sorted in a variety of orders for the needs that are required out of a particular database. This is a good function of Access 2010 that can make it easy for anyone to work with underlying Access database table data properly. 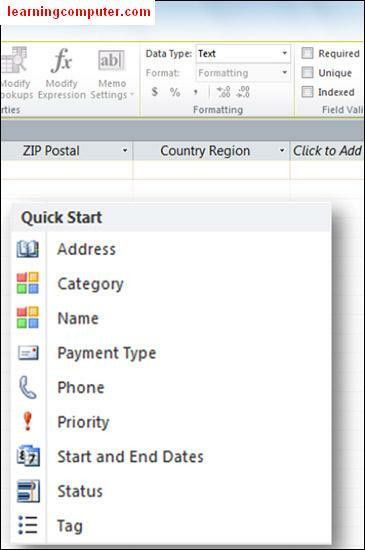 One unique feature of Access 2010 that was not available in prior editions of Access is the Quick Start feature. 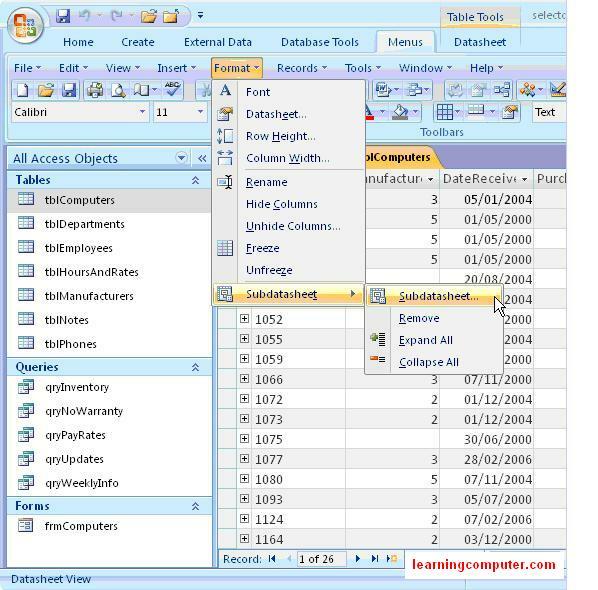 This can be used to add commonly used fields into a database table. This will be used to make it easier for an Access database to be created with different functions. These are the options available under the Quick Start menu. The subsets that are used in these areas will vary according to the option that is being used. For example, the Address section will include database for individual street addresses, city, state or province and zip or postal code boxes. 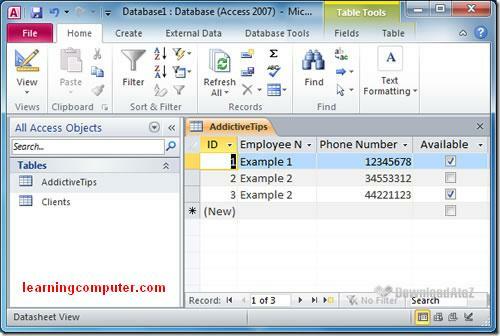 This is used in Access 2010 to make the process of entering data for individual things easy for anyone to handle. There is no need to worry about too many steps to get something to work. The last feature of Access 2010 to see is the SharePoint function. This works in that an Access 2010 file can be moved to Microsoft SharePoint Server 2010. This can be used to get an Access 2010 file out to a server so it can be seen and edited by a variety of different people who have access to the same program over the Corporate Intranet. This online collaboration helps with better communication among team members across difference geographical location. Here is an Access database table in Sharepoint. In fact, the database can be used on an online browser or through an Access 2010 client that is on a server. This is used to make it so a business will have an easier time with editing the programs that it is getting into. Business productivity can easily increased with this useful feature. Another amazing feature about Access 2010 comes from how extremely easy it is to get a few lines of code added into a program. A user can work to handle databases without writing any piece of code. This works through a variety of different functions including the Expression Builder. This tool is used to calculate formulas with ease and without any errors involved in them. Underlying programming in Microsoft Access is done with Visual Basic for Applications. The Macro Designer is another point to remember with Access 2010. This can work to implement certain actions easily handled in the program solving many problems involved. An image of the Macro Designer can be seen at the bottom. This program should be very simple for any Access 2010 user to handle. It is also easy to change how Access 2010 can look. It can work with its current appearance standard or with a Classic Menu design. This Classic design can be used to make Access 2010 look closer to the 2007 edition of the program. This might be useful for those who want to use the great features of Access 2010 while at the same time not being too confused when going from one older version of the program to a newer one. These are programming functions that show just how well Access 2010 can work for anyone’s database creation needs. You can see we are using if – then logic here within the Access database. Of course, there are many other functions for Access 2010 for anyone to review. The best thing to do in this case is to take a look at some important online resources for finding out details on all that Access 2010 has to offer. For those who require extra information about Access 2010 the following links may be a good ones to visit. –Try Access 2010 Training for 7-day FREE trial!